To answer as precisely as possible, please specify the subject of your request: date, place, event. After a double formation as a pianist and harpist, Caroline Lieby gets her harp price at the Conservatoire National Supérieur de Musique de Lyon in June 2008. Her solo career allows her to approach gradually the repertoire with orchestra. She is regularly invited to perform as a soloist (Dances of Debussy with the Chamber Orchestra of France, The concerto for flute and harp of Mozart, The concerto of Boieldieu with the Orchestra of the Royal Conservatory of Jordan), or in other formations as a harpist orchestra (Orchestre des Lauréats , La Chambre Philharmonique , the Academy of Music of Paris, Divertimento Orchestra, the Lutetia Orchestra, the Luxembourg Philharmonic Orchestra). Recently, she is the harpist in the Fire Brigade of Paris Orchestra. She particularly likes chamber music and its multiple possibilities, giving her the indispensable complement to her performer career : duo with flute or violin, duo with voice ( soprano or mezzo soprano ), trio with violin and voice, violin and cello, flute and cello, or flute and violin. She is also accompanied by a string quartet. She is specialized in private or corporate events, and has already performed in places such as the Louvre Museum, the Orsay Museum, The Palais de Chaillot, the Intercontinental Hotel, the Georges V Hotel, the Embassy of Great Britain, the Palace of Justice in Paris, the Château de Breteuill (78), The Château de Gouvieux (60) , to name a few … and thereby providing her solid references. She knows how to adapt her musical style, according to different themes or specific requests (baroque music, classical, romantic music, early twentieth century French repertoire, celtic repertoire, film music, some jazz, ceremonies repertoire … ). She ensures a quality and irreproachable performance, valued at many events and recitals. In order to radiate her instrument, she performs also in various places where classical music is less accessible, as in Retirement Homes or hospitals, and she is currently preparing a musical tale for children . 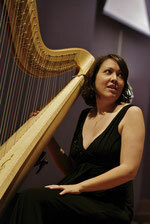 She also teaches harp in three conservatories near Paris, as well as private lessons.